At Vspa we offer a wide range of services for your eyes from eyebrow shape and tidy to eyelash extensions. Lash Lift is a natural lash enhancement that will give the appearance of thicker, longer lashes that can last up to 6 weeks. This treatment is incredibly popular and is an excellent alternative to eyelash extensions. 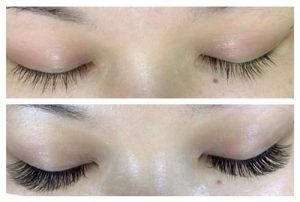 EYELASH EXTENSIONS BY FLIRTIES – GIVE YOUR EYES THE WOW FACTOR! Amazing semi-permanent eye lash extensions now available. We offer our lashes in various thicknesses and lengths to enable us to “match” the extensions exactly to your lashes and thus create an absolute natural look. We use CE certified adhesive that has been specially formulated by a group of eyelash manufacturers for exactly this purpose (cheap imports do not last!) You can trust our glue to be the best and safest for eyelash extensions. For the same reason we use CE certified debonder to keep you safe. The application process usually takes about 2 hours but can take longer depending on the number of extensions being applied. The procedure is very relaxing and comfortable. Eyelash extensions are individually applied onto the natural eyelash and will last up to 12 weeks with regular maintenance and care. To maintain the fullness and condition of the lashes it is recommended they are touched up every 2 to 3 weeks. Flirties eyelash extensions look and feel so natural and can be worn everyday, as well as for special occasions such as weddings. So for beautiful eyelashes look no further than the latest make up accessory Semi Permanent Eyelash Extensions from Flirties. Must book in advance and subject to availability with our lash technician. Consultation and patch test required. Russian Volume is the use of multiple ultra fine extensions, that are hand created at the time of application by the therapist using their specially designed tweezers. The therapist skilfully creates bouquets of eyelash extensions that are then placed onto the natural lash in a fanned effect, to create extra fluff, coverage and fullness than cannot be created with classic extensions. Although we use multiple extensions, the fan is still placed onto one individually isolated natural lash in a method that encases the natural lash, and results in great retention with zero damage. How is Russian Volume Lashes different from Classic Lashes? When one single lash extensions is applied to a single natural lash, this technique is referred to as classic lashes. With Russian Volume Lashes, the lash technician attaches more than one lash extension fiber to the natural lash by fanning them to make them appear like more lashes are growing from one stem. Depending on the effect the client wants, the technician can use 2 to 10 extensions per fan. The number of lashes used per fan is also dependent on the thickness of the extension. The lighter the extension, the more lashes per fan can be used. If you have an idea of what you would like, we recommend bringing in a photo with you upon consultation.